forming relationships with clients possessing differing personal characteristics. The influence of a specific personal characteristic, cognitive style, was investigated. Cognitive style, manifested perceptually as field-dependence--field-independence, is a salient dimension influencing characteristic modes of functioning in a diversity of areas. similar cognitive styles are able to communicate more effectively and form more positive relationships than persons having dissimilar styles. methods employed by workers when treating clients having differing cognitive styles. With field-dependent clients, workers would place relatively more emphasis on supportive techniques. With field-independent clients, workers would place relatively more emphasis on techniques that promote self-awareness. clients' scores on the Embedded Figures Test and evaluations of figure drawings were used to measure cognitive style. 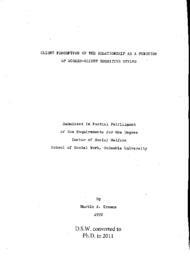 Client perception of the relationship was evaluated through the use of the Barrett-Lennard Relationship Inventory. This provided measures of worker regard, empathy, unconditional positive regard, and genuineness, as well as a total score. It was administered individually to each client immediately following the fifth interview. Classification of casework method was derived from worker judgments of the techniques considered most significant in achieving casework goals with each client. anticipated, greater specificity in differentiating relationship qualities than did field-dependent clients.